In this article we will discuss Windows Setup error "Windows cannot be installed to this disk" which appears with different messages during Windows installation. This guide covers 8 types of Windows setup errors, explaining causes and providing step-by-step solutions for each situation. This is a common but annoying issue, as it blocks the Windows installation process. If you are facing this problem, you can click the link below in line with the exact error information on your computer to view solutions. DiskGenius - Effective tool to test HDD, manage dynamic disk, convert MBR/GPT disk without data loss. Fix 1: Windows cannot be installed to this disk. The selected disk is of the GPT partition style. Fix 2: Windows cannot be installed to this disk. The selected disk has an MBR partition table. On EFI systems, Windows can only be installed to GPT disks. Fix 3: Windows cannot be installed to this hard disk space. The partition contains one or more dynamic volumes that are not supported for installation. Fix 4: Windows cannot be installed to this disk. Windows must be installed to a partition formatted as NTFS. Fix 5: Windows cannot be installed to this disk. This computer's hardware may not support booting to this disk. Ensure the disk's controller is enabled in the computer's BIOS menu. Fix 6: Windows cannot be installed to this disk. The disk may fail soon. If other hard disks are available, install Windows in another location. Fix 7: Windows is unable to install to the selected location. Error: 0x80300001. 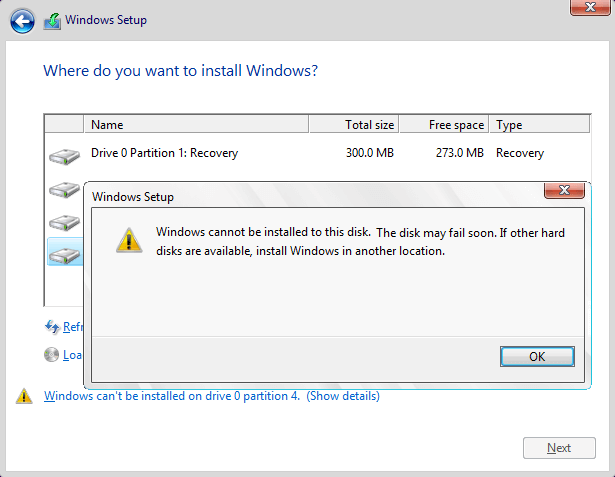 Fix 8: Windows cannot be installed to Disk 0 Partition 1. 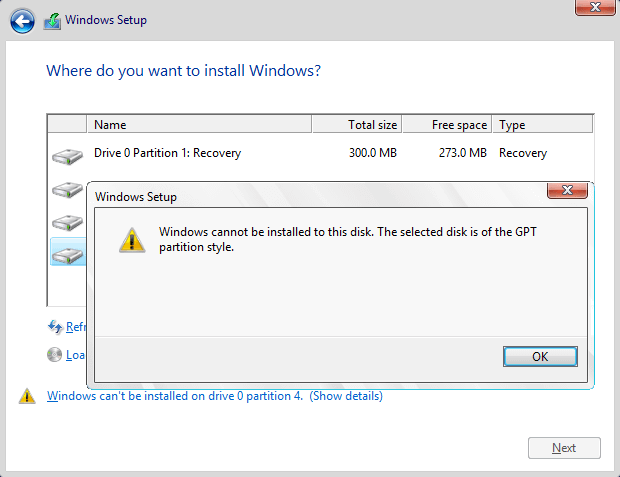 You may receive the error message "The selected disk is of the GPT partition style" when installing Windows OS to a GPT-style disk, see picture below. You will ask why Windows cannot be installed to this GPT disk. Generally, the main cause is motherboard. There are two types of boot modes: BIOS Boot Mode and UEFI Boot Mode. Most Windows versions have UEFI (Unified Extensible Firmware Interface) boot mode, while some versions since older days of Window XP have BIOS (Basic Input Output System) boot mode. Due to different boot modes, there are two types of partitioning schemes: MBR (Master Boot Record) and GPT (GUID Partition Table). If you want to boot system from GPT disk, the motherboard should support UEFI; while on BIOS you should use MBR partition table. Thus, if you install Windows on BIOS system and GPT partition table comes in your way. The installation will be blocked by the error. First of all, you should ensure the Boot Mode in your BIOS is set to Legacy BIOS instead of UEFI. At present, most motherboards support both legacy BIOS boot and UEFI boot. Thus, you need to make sure the proper boot mode is selected in BIOS setting. The picture shows the boot mode is modified to Legacy. Please note that the BIOS menu may look different on your computer, as it varies based on the models of the PC you have. Step 1 Backup all of your data on the GPT disk you want to convert, as the process will erase all data. If you can't afford to clean the disk or do not want to take efforts to back up data, you can convert GPT to MBR following steps in Solution 3 which does not disturb existing data. Step 2 Run Command Prompt. 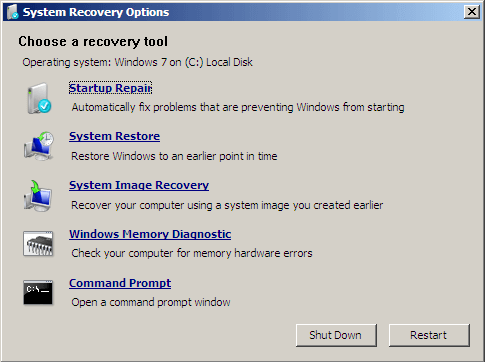 Boot computer from the Windows installation disk and go to System Recovery Options where you can choose Command Prompt. Step 3 Type diskpart in the command prompt and press Enter. Step 4 Type in list disk and hit Enter key to view which one is of GPT style. The GPT disk is marked with asterisk in the GPT column. Remember the disk number you need to clean and convert. Step 5 Type select disk # (# is the disk number and you should replace it with the actual number in your computer) to select disk. Notice: this step will completely clean up selected disk and all partitions and data will be deleted. Please make sure you have a backup before performing this command. Step 7 Type convert mbr and press Enter, and the disk will be converted to MBR. Then you can execute exit command to exit or continue creating partition on this MBR disk. 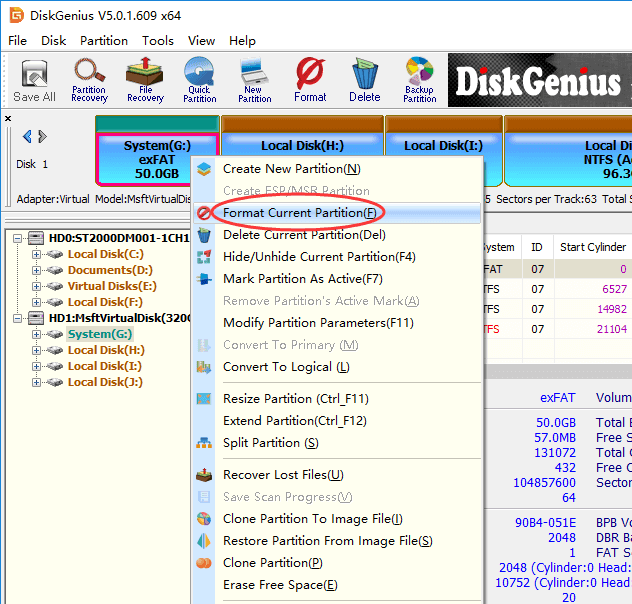 DiskGenius is free partition manager for all Windows users and it is able to convert GPT disk to MBR without data loss. If you are not comfortable with using Command Prompt, DiskGenius Free can be a good alternative, as it is easier and safer to use. Also, this partition tool can create WinPE bootable USB disk so that you can manage disk or partition when system fails to boot. Besides, it can help you back up data, image system, recover lost data or partition, backup partition table, etc. Step 1 Download, install and launch DiskGenius from your computer. If your computer cannot boot to system, you can create a bootable disk to boot computer, and then carry out rest task. Step 3 Click OK button from the message box which asks confirmation for the conversion. Tips: If capacity of the GPT disk is larger than 2TB, system can only make use of 2TB after it is converted to MBR. Step 4 Click Save All button from toolbar and click Yes from pop-up message box to save changes on partition table. GPT (GUID Partition Table) was introduced as part of UEFI which is the acronym for Unified Extensible Firmware Interface. GPT offers more flexible approach for disk partitioning than MBR partitioning scheme. A partition or volume is a contiguous area on a physical or logical disk and it is visible to system firmware as well as installed Windows system. System firmware controls the access to a partition before operating system boots and then partitions are controlled by OS. Currently many computers are capable of using the UEFI version of BIOS in order to speed up boot and shutdown time as well as provide security features. If you want to boot computer in UEFI mode, the disk installs operating system should be of GPT style. Many computers are able to use UEFI and they also provide CSM (compatibility support module) so that legacy version of BIOS can be used in necessary. The GPT drive format allows users to set up drivers larger than 4TB and does not limit partition number. The first try to solve the problem should be going through BIOS and changing UEFI boot settings. 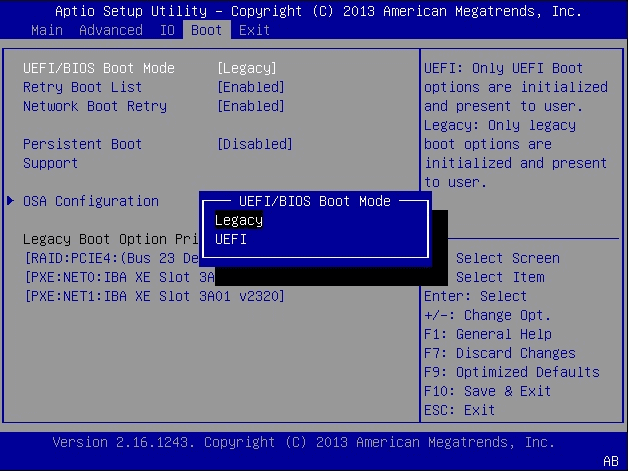 You can manually switch boot mode to legacy BIOS compatibility instead of UEFI mode. Step 1 Restart computer and enter BIOS by pressing specified key prompted by your motherboard manufacturer. The prompt appears on screen before system boots. Step 2 Go to Boot tab and locate boot order option. Then disable EFI Boot Source and change boot mode to Legacy. Step 3 Save changes and exit. Step 1 Install and launch DiskGenius Free. You can download this free partition manger free of charge from download center. 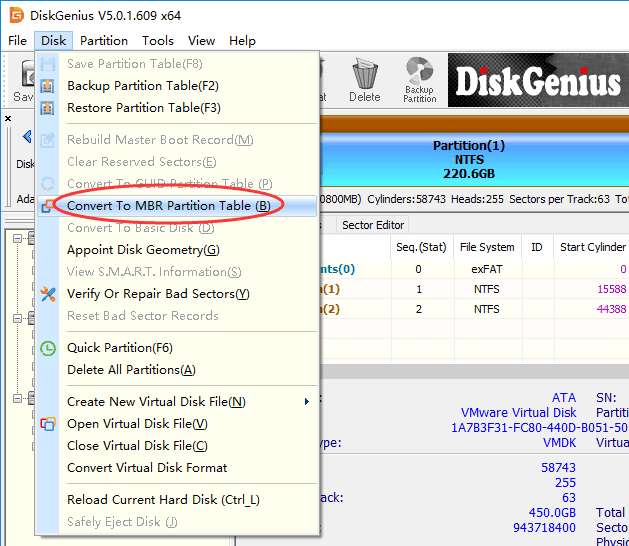 Step 2 Locate and select the MBR disk to be converted to GPT in DiskGenius and click Disk menu to choose "Convert To GUID Partition Table". When the disk is converted to GPT, you can retry installing Windows again and check if the error is fixed. The "The partition contains one or more dynamic volumes that are not supported for installation" error is likely to appear when you attempt to install Windows on a dynamic disk. Users are allowed to make a fresh Windows installation on a dynamic volume only when the volume was converted from a basic disk and retained an entry in partition table. However, simple volumes (except system or boot volumes before conversion) that have been converted from basic disks do not have an entry in partition table, thus the installation will end up with following error. What is basic disk and dynamic disk? Basic disk is a storage type mostly used with Windows, providing a solution to accommodate an array which changes storage requirement scenarios. This term refers to a disk containing partitions for example primary partition and logical partition which can be formatted with a file system to storage data. Generally, basic disks use MBR partition style since the disk is used by Microsoft MS-DOS operating system and all versions of Windows. Also, it supports GPT partitions on systems that support it. With basic disks you can create and delete primary, extended and logical partitions as well as format a partition or mark is as active. Dynamic disk provides features that basic disk does not, for example, it is able to create volumes crossing multiple disks as well as create fault-tolerant volumes. Both MBR and GPT partition styles can be used by dynamic disks as well. Dynamic disk provides greater flexibility for volume management, as it makes use of database to track information for volumes and other dynamic disks. Besides, dynamic disk volumes can be created on noncontiguous scope or physical disks, while volumes on basic disk should locate on contiguous extents on one disk. Step 1 Back up all volumes and data on the dynamic disk to be converted to basic, as this converting method removes all partitions and data on the disk. Step 2 Open Disk Management. Click Start and right click Computer to select Manage. Click Disk Management in the Computer Management window. Step 3 Delete all volumes on the disk. Right-click each volume on the disk you want to change to basic disk and select Delete Volume. Step 4 Right-click the disk and select Convert to Basic Disk. Once the disk is converted to basic disk, you can create partitions on the disk. Warning: If you want to keep your files on the disk, back up files or copy data to another disk before starting following steps. Step 1 Open Command Prompt. If there in not operating system on your computer, you can use Windows installation CD or bootable disk to boot computer and open CMD. Choose Repair your computer and then Troubleshoot to locate Command Prompt. 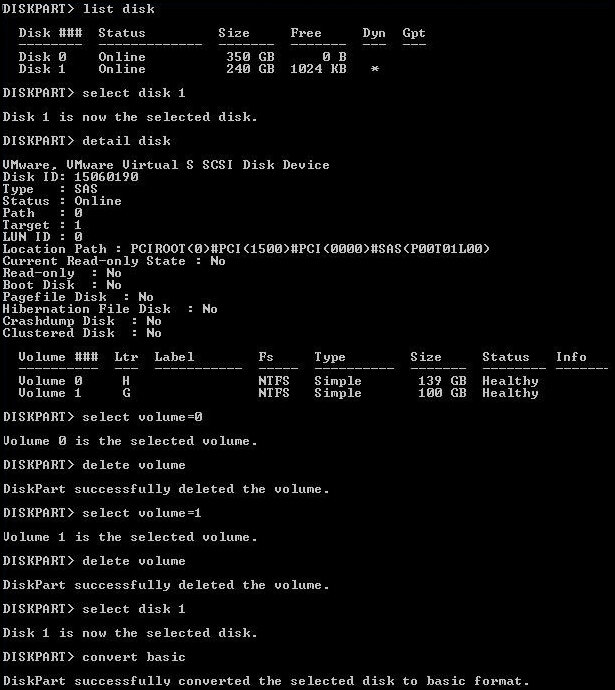 Step 2 Delete all volumes on the dynamic disk by typing following commands with pressing Enter after each command. To delete other volumes, you can continue typing select volume=1 -> delete volume one more time. Step 3 After all volumes are deleted, type convert basic and the empty will be converted into a basic disk. Both methods above require you delete all volumes and data before converting, thus you should make sure there are not important data or create a copy beforehand. Here is an alternative solution which is able to complete the conversion without losing data. DiskGenius is a professional dynamic disk converter, it is able to convert dynamic disk to basic without deleting volumes within several seconds. Let's see the entire converting process. 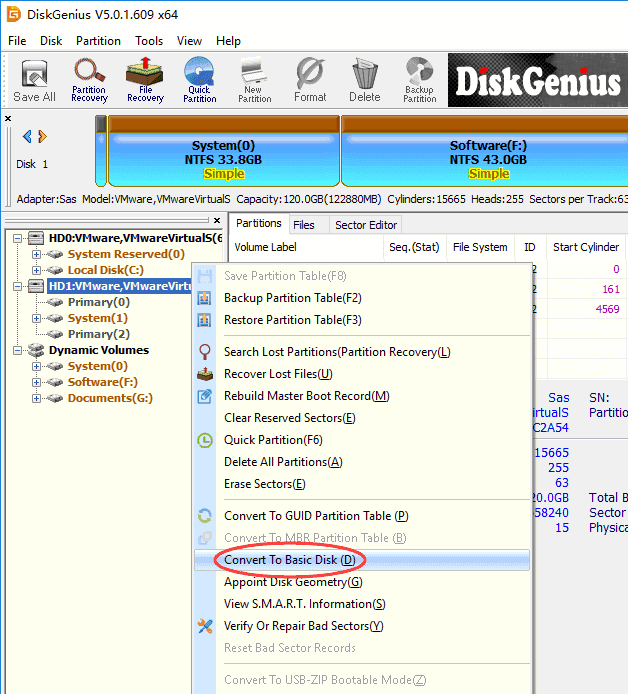 Step 1 Run DiskGenius and you can see the dynamic disk on the main interface. Step 3 Click OK button from the pop-up message box to make the changing work. Due to compatibility problem on file system, most versions of Windows operating system can be installed to partitions formatted to NTFS only and few versions can be installed to FAT partition. If the volume is formatted to an improper file system, you'll receive error "Windows must be installed to a partition formatted as NTFS". Since target partition has a file system issue, we can fix this error easily by changing its files system to NTFS. Step 1 Click Start button and enter cmd in searching box and press Enter. Step 2 Type convert G:/fs:ntfs in command prompt and press Enter. G is the drive letter of the partition that you want to change file system. You can open Windows Explorer to view the drive letter. Make sure the drive letter is correctly entered here. If it asks to enter the volume name, type in the name and press Enter. Step 3 Convert.exe attempts to convert file system into NTFS and the process won't take too long. Step 1 Copy the folder where DiskGenius installs to your bootable disk and then use the disk to boot computer. Besides, you can create a bootable disk with DiskGenius: Click "Tools" menu and choose "Create WinPE Bootable USB Drive of DiskGenius" option. 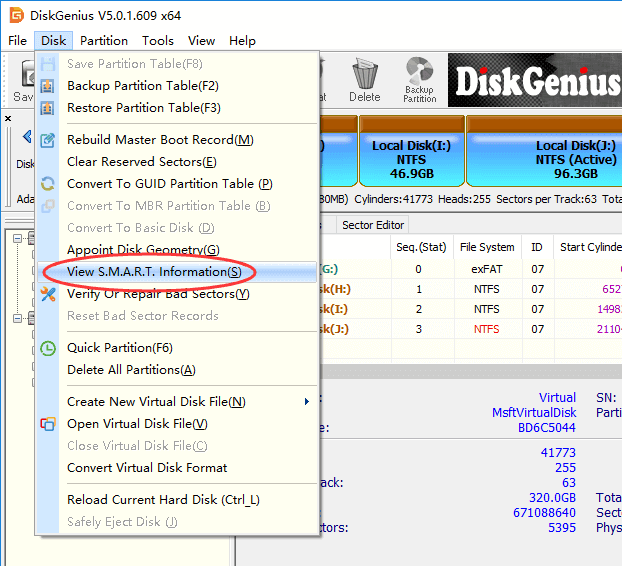 Step 2 Launch DiskGenius and right-click the system partition you want to format to select Format Current Partition. Step 3 Set the file system as NTFS and click Format button. As to options like Cluster Size, Volume Label, Surface Scan, etc. you can follow the default value set by partition manager. Step 4 Click Yes from the message box which prompts all files on this partition will be lost after formatting. You may receive the warning message "Windows is unable to install to the selected location. Error: 0x80300001…This computer's hardware may not support booting to his disk. Ensure the disk's controller is enabled in the computer's BIOS menu" when you try to install Windows. If you click Next to continue and you will receive another error "Windows cannot find a system volume that meets requirements for installation". This error may indicate that BIOS settings of your computer are not properly configured, thus you can try setting BIOS to factory and go back to default setting. Also, this issue is caused by hard disk mode; in that case, you need to change AHCI to Compatibility in BIOS. If there is not Compatibility option, you can select IDE. There might be something wrong with the hard drive if you get the error "Windows cannot be installed to this disk. The disk may fail soon. If other hard disks are available, install Windows in another location." You should be cautious if hard drive is damaged, as data on that disk may get lost. Similar to system warning Windows detected a hard disk problem, you should have a check for hard drive's health condition. Step 1 View hard drive S.M.A.R.T. information. Select the hard disk that may fail soon and click Disk menu to choose View S.M.A.R.T. Information. If the health status is NOT Good, then backup data and verify bad sectors following Step 2. Step 2 Verify bad sectors for hard drive in questions. 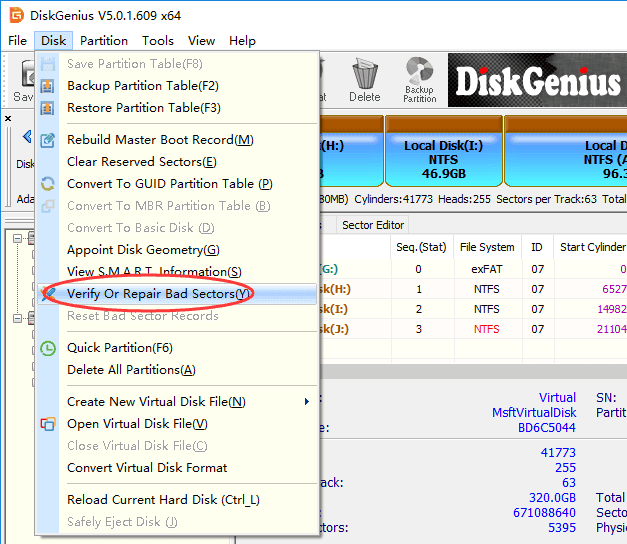 Still in DiskGenius, select the disk you want to check and click Disk to choose "Verify Or Repair Bad Sectors". Then click Start Verify button to start scanning sectors for selected area. If hard disk contains bad sectors, you can try repairing it with the program. Ensure that all files are backed up first, because bad sector repairing destroys. It's normal some bad sectors caused by physical damage cannot be repair. In that situation, you can manually create a hidden partition on that area to isolate bad sectors. Moreover, operating system shouldn't be installed to a hard drive that contains bad sectors. While install Windows 7 you might run into an error saying "Windows is unable to install to the selected location. Error: 0x80300001". This error typically occurs when you are asked to exchange hard drives in order to install required drivers on the system and the system disk hasn't been put back. It can also be caused by other reasons, so you may have to try more than one solution to solve it. Step 1 Boot computer using Windows install CD or USB disk to the setup wizard. Go to the step which requires selecting a partition and click Load Driver. When you see the error message, ignore it. Step 2 Reinsert the install disk and click Refresh link and then Advanced Drive Options to create a new partition with any size. If Windows prompts it has to carry out some operations, click OK. Then you can see a new system partition and a new primary partition. Step 3 Select the new primary partition and click Next button and the setup will continue without any errors. It's possible that this error occurs when the disk is not set as boot disk provided that you are not using RAID. In that circumstance, you can get rid of the problem by changing boot order in BIOS. Step 1 Enter BIOS Setup Utility. Turn on or restart computer and watch message appearing on screen, and a particular key such as Del or F2 will be displayed to enter BIOS. Press that key. Step 2 Select the Boot tab. All BIOS utilities look different, but boot option is definitely included. Locate and select it. Step 3 Set the hard drive where you want to install system as the boot disk. Any attached storage devices like hard drive, USB flash drive, floppy drive, etc. are listed here and you can change their order manually. Save changes and exit. People who try to install Windows using internal SAS controller for hard drive will encounter the message "Windows cannot be installed to disk # partition #". Usually this issue occurs due to SAS driver issue or corrupted MFT. The Microsoft Windows partition manager is out of touch with driver after changes were made on partition. Here is an approach to troubleshoot the problem. Step 1 When the Windows installation process asks where you want to install Windows, load the SAS driver from USB key. If the disk is larger than 2TB and needs to be converted to GPT, you can follow steps in previous solutions to do the conversion. 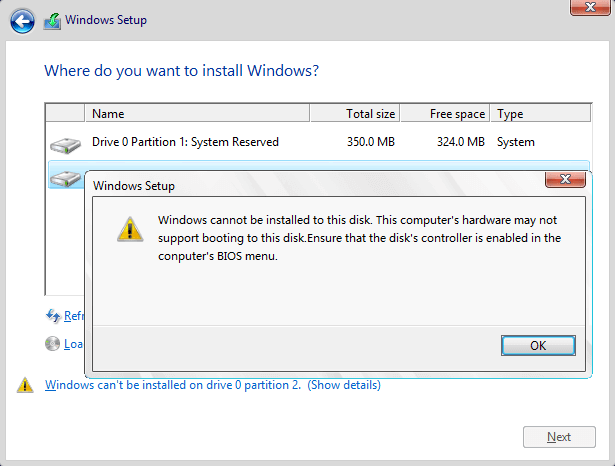 Step 2 View and check all possible partitions available for system installing. If the disk does not show up, have a check whether the driver is correctly installed. 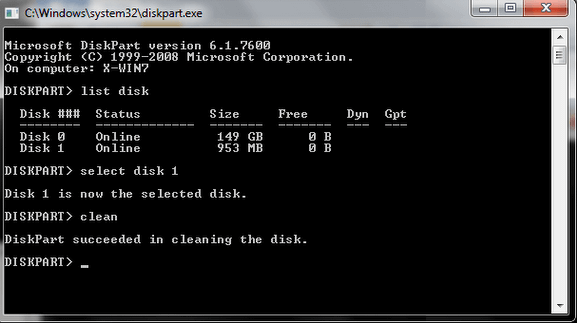 Step 3 Delete partitions until there is only Unallocated Space on the disk. Click New and you can see recommended partition size. Continue OK and you can see 3 partitions: system partition, MSR partition and large partition. 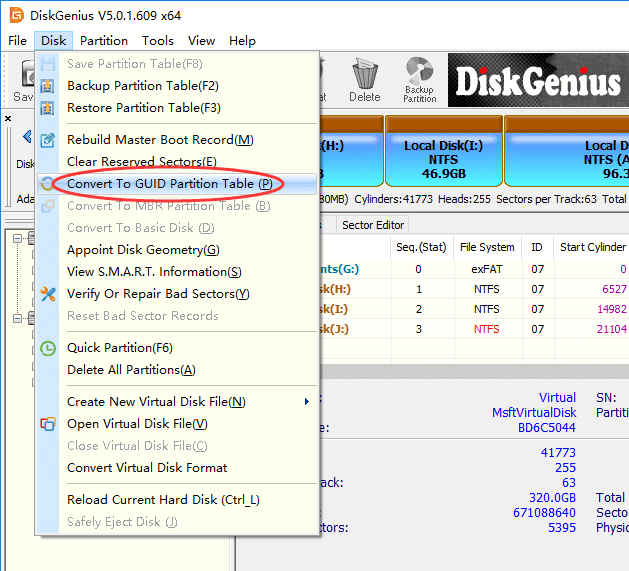 For this step, you can use DiskGenius to repartition the disk and choose GUID partition table, which is easier and intuitive. Step 4 Select the big partition and click Refresh. Then click Next to start installation. This guide includes 8 cases that "Windows cannot be installed to this disk" error appears during Windows se tup process. If selected disk is of improper partition table style corresponding to BIOS settings, Windows installation will be blocked by errors. This article provides step by step solutions to each situation. If you have better solutions, please feel free to contact us or share with other readers; many approaches in this article such as formatting disk and delete partitions lead to data loss, please make sure files and partitions are backed up beforehand; the free partition manager DiskGenius provides proper and effective functions to help fix this error occurring in different cases, and it is a qualified partition and disk management as well as data recovery program for both average and professional users. DiskGenius - Free partition manager to resize partition, convert MBR/GPT disk without losing data, etc.